Piemonte has a very long tradition of sweet wines, and of the various varietals used to make them, Moscato is the most important. It's mentioned in early 13th century documents, and though one cellar master I asked suggested that name Moscato derives from mosca (fly) because the grapes are so sweet they attract flies, the medieval writers were being much more respectful: Moscato (or Moscado) derives from the Latin Muscus, the musk so highly valued by perfume makers. In other words, the name Moscato is a nod to the grape's delicious aromas. Moscato's popularity continued through the 1300s and 1400s, and gained a significant boost from Duke Emanuele Filiberto Di Savoia's decision to reorganize the Duchy of Piemonte in 1560, reforming and supporting agriculture. Among other things he emphasized the production of quality wines in the hilly areas suited to wine making, and as a result Moscato vineyard area increased. In 1606 Giovanni Battista Croce, whose official post was Court Jeweler (he also had a keen interest in agriculture), published a treatise on the wines made around Torino, in which he singled out Moscato as known by all and used to make a wine by the same name, and went on to discuss production technique, saying that the winemakers would start the fermentation, which would be interrupted by the drop-off in temperature that naturally occurred in the fall. Come spring it was therefore sweet, low in alcohol, and also lightly carbonated, and they would bottle it and keep it cold to keep the fermentation from resuming. Unfortunately, a weak wine with unfermented sugars and yeasts is unstable -- the fermentation can resume, causing a pressure buildup that can lead to exploding bottles -- and therefore this particular kind of Moscato, which is a precursor to modern-day Moscato D'Asti, was something the winemakers made primarily for themselves. The renown of the Moscato grape continued to grow, however, and in the late 1700s the Società di Agricoltura di Torino singled it out as one of the best Piemontese grapes for making quality wine. It wasn't until the late 1800s, however, the modern Asti wines developed -- on the one hand Asti Spumante, now known as Asti, a sweet sparkling wine made primarily by large wineries working at industrial scale, and on the other Moscato D'Asti, a sweet semi-sparkling (the Italian term is frizzante) wine made primarily by smaller producers. The Disciplinari governing the production of the two wines, Asti and Moscato D'Asti, are quite similar: Both specify that the wine is to be made exclusively from the Moscato Bianco varietal produced within the production zone, from vineyards that are well lit and either on hilltops or slopes whose soil is either calcareous or at the most marly (calcareous clays). Vineyards on valley floors or other flat-lying areas are excluded, as are those not on the proper soils. The maximum allowable yield is 100 quintals/hectare, with a maximum yield into wine of 75 hectoliters/hectare, and new vineyards must be planted to at least 4000 vines per hectare. The grapes destined to the production of Asti must have sugar levels sufficient to produce 9% alcohol, while those destined to Moscato D'Asti must be able to produce 10% alcohol, and though the regione Piemonte can lower this limit to 9.5% for Moscato D'Asti in bad vintages, the rule indicates that Moscato D'Asti is made from riper, more concentrated grapes than Asti, and this in turn suggests that the yields of vineyards used to make Moscato D'Asti are lower than those dedicated to Asti -- something that makes perfect sense considering that Moscato D'Asti is primarily made by smaller producers, whereas Asti is primarily made in huge volumes by much larger wineries. Of course total alcohol content is a moot point with all Asti, be it Asti Spumante or Moscato D'Asti, because the winemaker chills the wine to interrupt fermentation before it has run its course, and thus keep the wine sweet, filters it to remove the yeasts (which would otherwise go happily back to work on the sugars if the wine warmed up), imparts sparkle, and bottles it. Asti, which is a true sparkling wine, with much more sparkle, gets a traditional mushroom cork and wire cage, whereas Moscato D'Asti, whose sparkle is much more subdued (maximum total pressure is 1.7 bars), gets a standard cork. Other important differences? Though the grapes used to make Moscato D'Asti must be sweeter, the wine is less alcoholic than Asti -- 4.5-6.5% as opposed to 7-9%. This, coupled with Moscato D'Asti's softer sparkle, will make the Moscato seem richer and creamier than its cousin. Finally, a word about the Consorzio: Asti (Spumante) and Moscato D'Asti have long been enormously popular, and it's therefore not surprising that Asti's winemakers were among the first to realize the importance of banding together. In 1932 they established a Consorzio, which was formally recognized in 1934, to oversee production and make certain the rules were followed. Asti and Moscato D'Asti were also among the first Italian wines to receive DOC status, in 1967, and both became DOCG wines in 1994. Enough History! What I tasted at Vintialy, primarily at the Asti Consorzio's stand. Pale Brassy gold with fine perlage. Delicate bouquet with honeysuckle and some greenish accents, mingled with hints of mapo (a grapefruit-tangerine hybrid grown in Italy). On the palate it's ample and rich, with clean citric fruit backed up by honeydew melon, and supported by sparkle and deft sweet acidity. Quite pleasant, and will drink very well on a patio or at poolside. Pale brassy gold with brassy reflections and fine perlage. The bouquet is powerful, with white plum fruit laced with some honeydew melon laced with citrus and heather. Inviting. On the palate it's full and quite sweet, with bright yellow plum fruit supported by sweet loquat acidity that flows into a clean sweet finish. Nice depth and richness, and will work well as an aperitif. Pale brassy white with fine persistent perlage. The bouquet is fresh, with ripe honeydew melon supported by loquat and sweetness. On the palate it's full, bright, and rich, with clean rich sparkle supported by delicate sweetness that flows into a long finish Quite elegant and perfect for an evening under the stars, r an afternoon under a patio. Pale brassy gold with gold reflections and ifne perlage. The bouquet is frehs, with loquat and floral accents supported by delicate minty accents. Pleasant. On the palate it's full and rich with powerful loquat fruit supported by clean sweet acidity that flows into a clean sweet finish. By comparison with the other Moscato D'Asti wines it is a bit more muscular, and not quite as deft in mouthfeel, though still pleasant. This was from the first lot. The second, which is bottled subsequently has finer perlage, Bruna says. Pale brassy yellow with greenish highlights and fine perlage. The bouquet is rich, with honeysuckle and honeydew melon supported by sweetness and hints of clover. Quite pleasant. On the palate it's full and sweet with nice honeydew melon fruit that gains definition and fullness from slight melon acidity and flows into a clean sweet finish. Perfect far from the table with friends. This wine is sold in a showy green glass bottle of the sort a (lady) genie might chose to live in. It's pale brassy white with brassy reflections and fine perlage. The bouquet is fairly intense, with bitter accents, some pungency, and underlying sweetness. On the palate it's ample and fairly rich with bitter notes that settle into a bitter finish. Pale brassy white with fine perlage. The bouquet is fresh with floral accents and some very ripe honeydew melon. On the palate it's full, soft, and sweet, with clean loquat fruit supported by delicate loquat acidity combined with sparkle that flows into a clean fairly rich finish. Pleasant, and will be nice with friends after dinner, far from the table. Pale brassy yellow with greenish reflections and fine perlage. The bouquet is moderately rich, and though sweet has a pungent underpinning and some savory accents. On the palate it's fairly rich, and by comparison with the Moscati considerably drier, with the greater dryness translating into a less seductive mouthfeel. In terms of fruit, there's ripe loquat laced with clean slightly savory accents that flows into a clean sweet finish that again has a slightly savory underpinning. Well made but in a mass market key. Pale brassy white with fine perlage. The bouquet is fairly rich, with white berry fruit and some underlying pungency that confers savory accents to the sweetness. On the palate it's full, with the fullness both fruit -- moderately intense loquat -- and perlage, flowing into a clean sweet finish. It has a slightly dilute feeling that may be related to the volume produced, but is pleasant and will drink well as a direct dessert wine. Taken as a group, I found the Moscato 'Asti to be richer and creamier. Asti was on the other hand lighter, and crisper, and a couple of the wines had a slightly dilute feeling to them as well. Considering the relative volumes of Moscato D'Asti and Asti produced, the differences make perfect sense, and would lead me to prefer bottle of Moscato D'Asti if wine-loving friends came calling and I decided to open a bottle of something light and sweet to enjoy as we talked. Asti might instead be a better bet at the close of a meal, when people are talking and less likely to be devoting all their attention to what's in their glass. Pale papery white with greenish reflections and fine perlage. Rich bouquet with floral accents mingled with loquat, honeysuckle, and very ripe honeydew melon. On the palate rich, with powerful clean tart loquat fruit supported by creamy sparkle and sweetness that flow into a long finish with loquat and honeydew melon sweetness that gradually fades into tarter loquat. Very fine, and will be wonderful in the shade on a hot day, or in the evening with friends. Pale brassy white with fine perlage. The bouquet is quite rich, with pungent honeydew melon supported by minty hints of sage, honeysuckle, and sugar. Mouthwatering. On the palate it's rich, with clean loquat-honeydew melon fruit supported by sugars that are deft and not at all cloying, and by smooth, creamy sparkle that flows into a long graceful finish that lasts and lasts, with the baance between loquat, sweetness and acidity holding rock steady as it fades. In a word, impressive. Pale brassy yellow with white rim. Rich bouquet with white fruit laced with sugars and clean spice, and some underlying lemony accents. Quite inviting. On the palate it's rich and full, with powerful white berry fruit supported by moderate sweetness -- it's not as sweet as the sparkling wines -- and by clean bitter accents from wood, while the texture is powerfully creamy, and flows into a clean finish in which the sweetness is again moderated by bitter accents. Quite elegant, and tightly controlled; the grapes were dried at low temperatures, which makes for freshness, while the wine went into wood to knock down the sweetness as well. It's extremely interesting and a very different expression of Moscato passito. If you like sweet wines, it will seduce you. This is a Sangiovese in purezza aged in small wood, and is Villa Petriolo's flagship wine; in presenting it they say it combines an attachment to the land with a modern approach in the cellar, and I would say I agree. The 2001 Golpaja Toscana IGT, which was released a few years ago and is by now entering maturity, is deep pigeon blood ruby with cherry rim, and has a fairly intense bouquet with red berry fruit supported by tart brambly acidity and some animal hair - wet horse - with hints of green leather too. Nice balance and quite rich. On the palate it's medium bodied tending towards full, with rich sour berry fruit supported by bright brambly acidity and hints of underbrush, and by smooth slightly greenish brambly tannins that flow into a long clean brambly finish with bright prune fruit and savory tannic underpinning. Quite nice, in a graceful scrappy key, and still quite young - it has at least another 5-8 years ahead of it. In terms of accompaniments, if you like this style, you might even be tempted to sip it far from the table. But it will go best with foods, in particular succulent, flavorful grilled meats. Elisabetta's aunt Adriana was serving steak and rosticciana (spare ribs well salted and peppered, and grilled over a gentle flame), and the pairing was just about perfect. A Note: I have been asked where to find these older wines. Unfortunately, unless one happens to have a bottle in the cellar one's options are limited (even in Italy): barring a visit to the winery, one can visit a well-stocked wine shop that also has older wines and the facilities to keep them properly -- ideally, a refrigerated room -- or a restaurant with a good wine cellar. Neither suggestion is ideal, I know, but I think it's important to discuss wines after they've been released, and see how they are doing. I have long liked Ranuccio Neri's wines, and was therefore rather distressed when he told me a few years ago that he was no longer making a white -- the people overseeing the production of Bianco Val D'Arbia, his appellation, had decided it required "sprucing up," and decreed that Chardonnay be added to it. Since he didn't have any and had no intention of planting any, he wasn't going to make it any more. Pale brassy white with brassy reflections. Pleasant bouquet with floral accents and heather mingled with white berry fruit and some spice form the grapes. Quite fresh and gives a good idea of what Trebbiano is capable of when well grown. On the palate it's medium bodied and deft, with clean mineral laced citric fruit that flows into a clean citric finish with underlying minerality, and though the term minerality is often overused, it's apt here. A very pleasant wine, which will drink well as an aperitif or with hearty vegetable or legume based soups, and also with simple meat or fish dishes, or with a slice of Tuscan pecorino cheese. Expect the bottle to go quickly. This is a blend of Sangiovese and Canaiolo Nero, and is pale salmon pink with brilliant highlights. The bouquet is bright, with heather and red berry fruit supported by clean raspberry acidity and some crushed sage herbal notes. Quite inviting. On the palate it's deft, with bright slightly greenish red berry fruit supported by raspberry acidity and smooth light tannins that flow into a warm tart finish. It's a bit of a lark, one of those wines that will finish before you expect it to. Ideal for a cookout or picnic, or indoors too, for example with quickly grilled meats or even pizza. Lively cherry ruby with cherry rim. Fresh bouquet with lively red berry fruit supported by clean slightly leafy underbrush. Deft, inviting, and pleasant in a traditional key, displaying considerable finesse. On the palate it's clean, with slightly brambly red berry fruit supported by warmth and brambly tannins with some vegetal accents that flow into a clean bright finish. It's a bit young -- a year would add grace -- but will drink quite well with grilled meats or light stews, and I'd be tempted to serve it with a platter of mixed fried meats and vegetables too. It's one of those wines you will set out, turn your back, and find empty when you turn around again. Tawny amber; the color is dark because Ranuccio also slipped some Caniolo into it. Fairly rich bouquet with dark brown sugar laced with walnut skins, dried fruit, and some walnut butter acidity. Inviting. On the palate it's full, and quite sweet, with elegant brown sugar sweetness supported by warmth and clean apricot acidity that flows into a long warm finish with brown sugar and dried apricot overtones. Quite nice, and if you're a fan of sweet wines (and I am9 you will enjoy it. I haven't said much about the Brunello scandal of late, mostly because to write well about it one must be in Montalcino with one's ear to the ground. I am not. However, Monty Waldin is, and his report, which Franco Ziliani has reposted, is frankly frightening. And very much worth reading (Scroll down past Franco's Italian to Jancis Robinson's introduction in English and Monty's report, also in English). To add to this, another friend and colleague tells me that the Italian police have paid visits to all the major figures involved in the Brunello scandal -- cellar masters, agronomists, winery owners, consulting enologists and so on -- and examined the hard disks of their computers. Since many of these people, especially the consulting enologists, also work elsewhere, the scandal could very well spread to other appellations. The other thing my friend says is that the investigation no longer just regards winemaking. The inspectors are looking at land use, hiring, accounting practices, and everything else. It will take a while for the dust to settle, I fear. Frascati is one of the classic Roman appellations, a white wine that many (correctly) associate with open-air dining in the Eternal City - it's one of the wines commonly sold by the pitcher in Roman eatieries, and goes very well with the classic quickly cooked Roman pasta dishes, for example bucatini all'Amatriciana or saltimbocca alla Romana. Given its association with Roman trattorie, one might be tempted to dismiss it as a jug wine of little consequence, But I wouldn't agree. At least not completely; there's no denying that a lot of Frascati DOC is jug wine, but there are also winemakers who are devoting care and attention to it, with excellent results. To begin at the beginning, Frascati, like many other Italian wines, is a blend: It must be 50% Malvasia Bianca di Candia. That's set, but winemakers have considerable latitude for the remaining 50%: 10-20% Trebbiano Toscano, 10-40% Malvasia del Lazio (the Puntinata clone), and also up to 30% Greco, Trebbiano Giallo, Bellone, and Bombino Bianco, and up to 15% other white varietals allowed in the Regione Lazio. In other words, a Frascati could be 50% Malvasia Bianca di Candia, 10% Trebbiano, and 40% Malvasia del Lazio, but it could also be 50% Malvasia Bianca di Candia, 10% Trebbiano Toscano, 10% Malvasia del Lazio, and a combination of one or more lesser varietals -- for example, Greco and Grechetto are popular, as is Bombino Bianco, while another producer who is aiming for a more international wine adds Sauvignon Blanc instead. The one varietal nobody I talked with was enthusiastic about was Trebbiano Toscano; most said they used the minimum required and no more. Vineyards must be planted on well exposed, well-drained but not totally dry volcanic soils rich in potassium and phosphorous, and poor in calcium. The minimum planting density for new vineyards is 3000 vines per hectare, while the maximum yield is 140 quintals per hectare for Frascati Spumante (which I didn't taste) and 130 quintals per hectare (13 tons) for Frascati Superiore. This is a lot, and many producers farm to lower yields. Fermentation is generally in steel, but wood is allowed, and some producers are using it with their Frascati Superiore, with interesting results. The appellation allows the production of both. As one might expect, plain Frascati is slightly less concentrated and less alcoholic: It is released in the spring following the harvest, and must be at least 11% alcohol, have a minimum acidity of 4.5 g/l, and a minimum dry residue of 15 g/l. Producers can indicate the vintage but are not required to do so. Frascati Superiore is also released in the spring following the harvest, but must be at least 11.5% alcohol, with a minimum total acidity of 4.5 g/l, and a minimum dry residue of 15 g/l. Producers must indicate the vintage. The other important thing to keep in mind when selecting Frascati is that it can be either dry - Secco - demi-sec - Amabile - or sweet - Abboccato, and the label must say what it is. I bring this up as a matter of scruple, because all the Frascati Superiore I was given at Vinitaly -- I simply asked producers for their Frascati Superiore -- was Secco. Nobody offered anything Amabile or Abboccato. And what to drink with these wines? Simple, quickly cooked foods ranging from pizza through vegetable frttatas and eggplant or pepper-based dishes, to red sauced pasta dishes (and pasta alla carbonara), and onto quickly cooked meats or fish, including mildly spiced oriental dishes. In short, Frascati Superiore is quite versatile, and will contribute nicely to a wide variety of situations. Lively brassy gold with brassy reflections. The bouquet is fresh, with some bitter accents mingled with white berry fruit and moderate acidity. On the palate it's light, and rather soft, with clean mineral-laced citric fruit that flows into a clean bitter finish. Direct, and will drink well with foods, but doesn't display as much depth as I might have liked. This is made from Trebbiano Verde, Malvasia del Lazio, and several other autochthonous grapes. It's bouquet is surprisingly rich, with clean herbal accents including heather from a freshly cut field, minerality, and some wood smoke too. Pleasant complexity. On the palate it's full and rather languid, with pleasing minerality supported by mineral acidity that flows into a clean mineral finish. It's fairly direct, a food wine that will drink well with white meats or fish, and also be a nice apartitif. Quite fresh, and the bottle will go quickly. Cantine Colli Di Catone S.r.l. Pale brassy yellow with greenish brassy reflections. The bouquet is fairly mineral with some greenish accents. On the palate it's direct, with clean bitter accents and some savory notes that increase in the finish. It will work quite well with foods. This has more Malvasia del Lazio, and some Chardonnay to increase fruitiness -- a wine they developed to attract international consumers who might not be interested in a Frascati. It's pale brassy white with brassy reflections, and has a fairly rich bouquet with floral accents and minerality (the former from the Chardonnay) supported by hints of wood smoke and heather from a cut field in summer. On the palate it's full, and languid, with pleasant white fruit -- specifically yellow peach -- supported by a mix of tart minerality and warmth that flows into a long warm peach and white plum finish. Pleasant and quite approachable; it will drink well with simple meats or fish, and also work well with vegetarian dishes. This is a 50-50 blend of Malvasia del Lazio and Malvasia di Candia; it's brassy yellow with brassy reflections and has a fairly intense, quite mineral bouquet that gains depth from hints of wood smoke, vegetal accents, and spice. On the palate it's full, and quite mineral, with clean rather languid minerality that flows into a clean mineral finish with tart overtones. This is a single vineyard wine made entirely of Malvasia del Lazio. The fermentation is long and slow, and it then spends a year in tank, followed by 2 years in bottle. It's lively brassy yellow with brassy reflections and slightly greenish reflections. The bouquet is pleasant, with white berry fruit mingled with mineral acidity supported by pungent overtones. On the palate it's rich, with bright tropical fruit -- pineapple laced with grapefruit -- supported by greenish acidity and slight sweetness that flows into a long greenish finish. Pleasant, and interesting from a wine writer's standpoint because it provides concrete proof that Frascati can age much better than is generally thought. It will drink well with firm, not too sharp cheeses, and with white meats. Atypical for a Frascati, but I enjoyed it, and one could also drink it chilled on a hot day. Brassy gold with brassy reflections. The bouquet is beginning to mature, with pungent gunflint ingled with tartness and hints of caramel; it's pleasant. On the palate it's full and languid, with clean soft white berry fruit supported by savory minerality that flows into a long savory finish. Pleasant, and eye-opening, because one would never expect a Frascati to age this well for this long. Lively greenish gold, and looks a little fresher than the 2001. The bouquet is too, with deft gunflint supported by minerality and clean spice, with underlying caramel and savory accents. On the palate it's full and fresh, with clean citric pineapple fruit supported by clean spicy minerality and considerable tart acidity that flows into a clean tart finish. Quite nice, and I would never have guessed its age; I rather suspect the vintage was cooler than 2001, and this makes for the greater freshness. A pity to pour it out. Brassy greenish gold with brassy reflections. The bouquet is fairly rich, with citric fruit mingled with some gunflint; by comparison with the 98 it's not as well defined and stumbles some, though it is pleasant. On the palate it's full, and rich, with fairly intense minerality laced with clean citric acidity; by comparison with the 98 it's less acidic, and therefore more spread out. The finish is clean and savory with gunflint bitterness. Pleasant, quite, in fact, though the 98 has greater depth and finesse. Deep lemony yellow with brassy reflections; it shows its age but isn't discoloring. The bouquet is moderately intense, with gunflint that opens to reveal spice and bitterness as well. Fair amount going on. On the palate it's ample and clean, with bright lemony fruit supported by peppery spice and clean bitterness that carries, along with the fruit, into a very long citric finish. A decidedly pleasant surprise, because I would never have thought Frascati capable of aging this way. Pale brassy white with greenish reflections. The bouquet is fairly intense with pleasing hoppy (as in the aroma of the hops one adds to the wort when making beer) accents supported by greenish acidity and some spice. A bit unusual for a Frascati, but I liked it. On the palate it's full, and fairly sweet, with bright minerality that has some greenish tannic support from the grapes, and flows into a warm fairly sweet finish that gradually resolves into clean tart acidity. Pleasant, and frankly intriguing on the nose, and will work well as an aperitif with cheese or fish dishes, and will hold well for 3-5 years. The hops are particular, but if you like them you will enjoy the wine very much. Pale brassy yellow with brassy reflections. The bouquet is delicate, with minerality mingled with some heather and clean bitterness with underlying acidity. On the palate it0s full, with rich honey-laced very ripe apricot fruit that gives way to mineral warmth with a long warm acidic burr. Quite nice, and will work very well as an aperitif or with fish, and also with quickly cooked meats. Worth seeking out. Pale brassy yellow with brassy reflections and pale rim. The bouquet is fairly rich, with greenish honeydew melon supported by gunflint and some spice with hints of underlying sweetness. On the palate it's ample and smooth, with fairly rich lemony fruit supported by cleans our lemony acidity and a slight greenish tannic burr from grapes that flows into a warm citric finish. Quite approachable, in a direct sort of way, one of those wines one sets out on the table and has to replenish quickly; drink it with light, zesty summer foods. Pale brassy yellow. The bouquet is fairly rich, with clean mineral acidity mingled with hops and some gunflint. On the palate it's light, and deft, with considerable minerality that grows in warmth and flows into a clean mineral finish with slight savory accents. Pleasant in a very direct key, and will drink well with antipasti, deft fish, and quickly cooked meats. Deeper gold than many, with brassy reflections and highlights. The bouquet is delicate, with pleasant floral accents supported by clean minerality and hints of honeydew melon, which are joined by heather and sage as it opens. On the palate it's ample and fairly soft, with moderate minerality supported by tart bitterness that flows into a clean mineral finish. I's have liked greater fullness on the palate; it ocmes across as a bit flat, and is less interesting than the nose suggested. This is a blend of Malvasia Puntata, Malvasia di Candia, Trebbiano del Lazio, and Trebbiano Toscano. It's brassy yellow with golden reflections, and has a bright bouquet with heather and honeydew melon mingled with some spice and minerality. On the palate it's full, with bright mineral acidity and clean citric fruit supported by clean spice and slightly greenish tannic support from grapes that flow into a clean fairly bitter finish. Pleasant, and will work nicely as an aperitif or with a wide spectrum of quickly cooked foods. Expect it to go quickly. This has the same varietals, plu 30% Greco. It's pale brassy gold with pinkish highlights due to the Greco. The bouquet is fairly rich, with minerality and white berry fruit supported by some gunflint, a degree of bitterness, and some animal hair. On the palate it's full and round, with pleasant white peach fruit that gains direction from yellow plum acidity and flows into a clean tart finish. Pleasant, and will drink very well as an aperitif or with quick summer dishes. By comparison with the Frascati base it's a bit heavier and not quite as graceful, but pleasant nonetheless. Pale brassy yellow with brilliant reflections. Clean bouquet with deft minerality and hints of graphite mingled with some greenish acidity. The palate is ample, and sweeter than one might have expected, with pleasant white fruit - plum and peach - supported by clean white berry fruit acidity that flows into a clean fairly long finish with clean bitter accents. Pleasant, and has a fair amount to say. Pale brassy yellow with brassy reflections. The bouquet is elegant, with minerality laced with some gunflint and greenish accents. On the palate it's quite mineral, with clean minearal acidity that flows into a mineral finish. Pleasant, but I'd have liked greater richness overtones the palate. Pale brassy white with brilliant brassy reflections. The bouquet is fairly rich, with floral accents mingled with some minerality and hints of honeydew melon with underlying vegetal spice. On the palate it's medium bodied and bright, with ample white fruit -- peaches with some tart apricot -- supported by clean fresh acidity that flows into a warm finish. Direct, and a bit short, and while this shortness invites another sip, it also means the bottle will go even faster than it otherwise might. A perfect wine for simple foods, and ideal on cookout or picnic. Via Val de Paolis s.n.c. Pale brassy white with brassy reflections. Fairly rich bouquet with bright hops mingled with spice and slight greenish accents, and underlying ground pepper and gunflint. Quite a bit going on. On the palate it's bright, with pleasant honeydew melon fruit laced with warm hoppy acidity and flows into a clean mineral finish. A very pleasant lark of a wine. Pale brassy yellow with brassy reflections and white rim. The bouquet is rich and quite mineral with heather and some faintly lemony acidity. On the palate it's full and rich, with fairly intense lemony fruit that gains depth from hoppy greenness and flows into a clean fairly long mineral finish. Quite pleasant, and will drink well with antipasti, egg-based dishes, and quickly cooked lighter meats, for example Saltimbocca. Worth seeking out. This is a blend of Malvasia, Malvasia del Lazio, Trebbiano, and Grechetto; it's pale brassy gold with greenish reflections and white rim. The bouquet is fairly intense, with clean heather and some minerality. On the palate it's fresh, and savory, with clean citric acidity supported by savory accents that flow into a warm lemony finish with tart accents. Quite nice, and will work well with quickly cooked meats, fish, and fried meats and vegetables. This undergoes slight cryomaceration prior to fermentation; the wine is brassy white with brilliant brassy reflections, and has a deft bouquet with clean minerality laced with savory accents and slight hints of banana. On the palate it's ample and bright, with white berry fruit and savory apricot fruit supported by clean bitter acidity that flows into a clean bitter finish. It displays considerably more depth than the basic wine, and will work very well with fish, or with creamy white meats, and has the capacity to age well for a number of years. Worth seeking out. This is 70% Malvasia Puntato del Lazio, with the remainder a mix of Trebbiano, Greco, and Bombino, which is an old autochthonous varietal of the Castelli Romani. It's pale brassy white with brassy reflections and some greenish highlights, and has a clean bouquet with minerality and heather mingled with herbal accents. On the palate it's full and bright, with clean sour lemony fruit supported by sea salt minerality from the soil and by warm slightly greenish acidity. Pleasantly refreshing, and will drink nicely with foods. Pale brassy white with brassy reflections. The bouquet is fairly rich, with heather and minerality supported by clean brambly acidity and some eucalyptus. On the palate it's bright,with pleasant minerality that gains warmth as it flows into a long mineral finish. Quite drinkable, and will work well with a wide variety of light, quickly prepared foods -- in other words, Roman cooking. Lively brassy gold with greenish brassy reflections. The bouquet has floral accents mingled with savory minerality. On the palate it's ample, with clean pleasant not-too-ripe yellow peach fruit supported by warm acidity that flows into a clean, fresh, fairly tart finish. Pleasant, in a rather graceful way, and will drink quite well with foods. Pale brassy yellow with brassy reflections and greenish highlights. The bouquet is fairly rich, with bright pineapple fruit supported by clean heather and some bright acidity. Quick to write, but there's a lot going on. On the palate it's full, and bright, with clean savory lemon fruit that gains depth from some mineral acidity and flows into a clean fairly bitter finsh. It's quite approachable, and will drink well with a wide variety of foods, from antipasti through salads and such, and on to quickly cooked meats or fish. Pale brassy gold with greenish reflections. The bouquet is fairly intense, with pungent minerality laced with gunflint and some hints of caramel, and some sea salt. On the palate it's full, and bright, with pleasant minerality mingled with citric accents that flow into a clean citric finish with some apricot overtones, and minerality. Pleasant, displaying considerable finesse, and will drink very well with foods, though I might also be tempted to sip it far from the table. Worth seeking out. The word "People" in English because it's a wine for everyone -- 20% Trebbiano, 10% Sauvignon, and 70% later-harvested Malvasia. Pale brassy white with brassy reflections. The bouquet is rich, with elegant floral accents laced with slight gooseberry and honeysuckle. On the palate it's ample and soft, with moderately rich white fruit, in particular peach, supported by clean moderately intense mineral acidity that flows into a clean bright finish. It's very approachable -- the People is apt -- and though a purist would frown at the Sauvignon, which adds a "come hither" feel, it is pleasant in an international key and will drink nicely at table. Tasted a prerelease sample; this is a selection of Malvasia and Trebbiano late harvested and fermented in upright open casks, followed by time on the lees. It's deeper gold with brassy reflections and has a much more intense nose, with citric and tart apricot acidity laced with herbal accents and some savory notes. Nice balance in a charged way. On the palate it's ample, with fairly bright ripe apricot fruit that has an unexpected languid sweetness to it and flows into a fairly bitter finish. While the nose is charged, the palate lumbers, giving an impression of a muscular person gasping after trying to run on too hot a day. Brassy yellow with brassy reflections. The bouquet is bright, with fresh rather pungent floral accents supported by clean bright yellow berry fruit and quite a bit of heather, and some bitter notes. Quite concentrated, and as it opens hoppy notes emerge too. On the palate it's bright, with lively minerality and clean citric acidity supported by greenish notes that flow into a clean sour white berry fruit finish. Quite drinkable, and will vanish from people's glasses at table. "Bonum vinum letificat cor omnis," Good wine uplifts the hearts of all. This is Malvasia from an old vineyard, blended with Trebbiano and Bombino Mollo, another old varietal. It's pale brassy yellow with greenish highlights, and has a rich, clean bouquet with greenish honeydew melon supported by clean minerality and some spice, with gunflint as well. On the palate it's full, with bright minerality supported by clean citric acidity that flows into a clean, long bitter mineral finish. Pleasant in a more charged, more serious key, and will drink well with a wide variety of foods, from cheese or egg dishes through fish and onto white meats, and will also age nicely for at least 3-5 years, if you want to keep it that long. This is made from four varietals: Malvasia di Candia, Malvasia del Lazio, Trebbiano, and Greco. It's pale brassy yellow iw brassy reflections and white rim, and has a fairly rich bouquet with white flowers laced with honey and white peaches, and some underlying savory accents. On the palate it's bright, with brambly minerality that flows fairly quickly into a bitter finish with savory accents that is refreshing and will lead it to work well with foods. In short, direct and up front, and will drink well with foods. This is a vineyard selection made from Malvasia Bianca di Candia, Trebbiano Toscano, and Malvasia del Lazio, with 30% Greco and Bombino. It's pale brassy yellow with brassy reflections and has a delicate bouquet with white flowers mingled with minerality and some savory accents. Nice balance and pleasing freshness. On the palate it's bright, with tart minerality that flows into a clean mineral finish; it's pleasant and will drink very well with rich pasta dishes or quickly cooked meats - I found it growing upon me and would be happy to seek it out. They have 50 hectares in Frascati (85 in all), and are ripping out Trebbiano in favor of Malvasia del Lazio, Greco Bianco and Grechetto. They aim to finish up with the minimum amount of Trebbiano required by the appellation, 10%. Pale brassy yellow with brilliant brassy reflections. The bouquet is fairly intense, with greenish herbal accents mingled with minerality and some gunflint, and underlying airiness. Quite fresh. On the palate it's bright, with clean warm lemony fruit supported by clean sour acidity that flows into a clean tart finish. Quite approachable, and will drink well with quickly cooked fish or meats, and also with Roman dishes in general. Expect it to go quickly. This has 20% Greco and Grechetto, and undergoes cryomaceration prior to fermentation, as well as 2 months on the lees subsequent to it with battonage. It had just been bottled when I tasted it, and had a rich bouquet with delicious apple mingled with ripe banana, which is an effect of the battonage; I would expect it to have gained minerality with time, because on the palate it's pleasingly full, with considerable glycerine -- another effect of battonage -- mingled with citric minerality that flows into a warmlemony finish with pleasing hints of licorice that are again an effect of the winemaking technique. It's deft, and will be quite nice as an aperitif or with fish or white meats. A nice application of modern technique -- battonage -- to a traditional wine. Worth seeking out. Lively greenish gold with brassy greenish reflections. The bouquet is fairly rich, with brambly heather mingled with minerality, honeysuckle and some spice. On the palate it's fresh, with bright brambly white berry fruit supported by clean slightly greenish minerality that flows into a clean savory finish. Pleasant in a slightly overbuilt way -- there's not as much finesse as in some -- but will work well with foods. This is amabile, or sweet, and from late-harvested grapes. It's pale brassy white with greenish reflections and white rim. The bis fairly sweet, with rich floral accents - white blossoms mostly - mingled with hints of menthol and spice. On the palate it's clean, and sweet, with bright stewed regina Claudia plum fruit that gains direction from moderate acidity. 10% of the grapes undergo cryomaceration; it's pale brassy white, and has a fresh bouquet with clean floral accents and white berry fruit, while depth comes from savory notes. On the palate it's bright, with pleasant apricot-white plum fruit supported by clean lemony acidity and underlying minerality. Pleasant in a light deft key, and will drink nicely with simple meat or pasta dishes, and also with pizza and similar. Expect the bottle to go quickly. This is called Crio 8 because all the grapes cryomacerate for 8 hours. It's pale brassy yellow with slight pinish highlights and brassy reflections. The bouquet is bright, with deft minerality supported by white peach fruit and some floral accents. Pleasant. On the palate it's full, with bright minerality laced with some citric acidity that flows into a clean mineral finish. Again pleasant, and will drink well with a wide range of foods, from pasta with red sauces through fish and quickly cooked white meats. Expect the bottle to go quickly. A 50th anniversary bottle. It's pale brassy yellow with brassy highlights and reflections. The bouquet is fresh, with pleasing floral accents and some minerality mingled with white peaches. Pleasant to sniff. On the palate it's bright, with clean white fruit supported by minerality and moderate acidity that flow into a clean moderately mineral finish, Direct, and quite welcoming; it will drink well with a wide variety of foods, and also be pleasant with friends on a hot day when the wine is not the reason for the gathering. Pale brassy white with white rim. The bouquet is mineral, with some underbrush and slight gunflint. Airy. On the palate it's ample and rather languid, with warm lemony fruit supported by slightly greenish bitter minerality that flows into a clean rather bitter finish. It's heavier than the basic Frascati, and comes across as trying hard, but to my mind comes up a bit short. This is a new wine that's 50% Malvasia di Candia, 10% - the minimum - Trebbiano Toscano, 20% Malvasia del Lazio, and 10% each Greco and Bombino, and has a striking black and silver label. The wine is brilliant brassy yellow with golden highlights and has a fairly rich bouquet with apricot fruit laced with some green honeydew melon acidity and underlying savory accents with hints of wood smoke too. On the palate it's ample and rich, with fullness coming from glycerin and minerality supported barnyard tang tart warmth, while there is also ripe apricot fruit in the mix. Pleasant in a more muscular (for Frascati) key; if you prefer the lighter, tighter wines it won't work for you, but if you like this slightly bigger style you will enjoy it. The François family has owned Castello di Querceto for generations, and were among the first to realize that in order to survive and prosper they had to produce quality, not quantity. To do this one has to get to know one's land, and in 1973 Alessandro François decided to try producing a cru, or single-vineyard wine. At the time this it was a revolutionary idea for Chianti, and the results were, frankly, eye-opening: The first vintage of the new wine (1978), which he called la Corte, was quite good. So he decided to make more, and even though now the idea of making crus has passed from fashion in Tuscany, he continues, because he finds them to be the best way to highlight the nuances of the land. Truth be told, La Corte wasn't a shot in the dark: Alessandro's grandfather Carlo, one of Chianti's pioneering winemakers, had vinified that particular vineyard separately 70 years previously. But it did confirm the validity of making crus. Encouraged by La Corte's success, in 1985 Alessandro introduced Il Querciolaia, a 65-35 blend of Sangiovese and Cabernet Sauvignon. Next came Cignale, first produced in 1986, a blend of 90% Cabernet Sauvignon and 10% Merlot. And in 1988 Il Picchio a Chianti Classico Riserva made according to Barone Ricasoli's formula for wines to be aged: Sangiovese (92%) to provide power, and Canaiolo (8%) to temper Sangiovese's vigor. And finally, after a period of reflection, in 1998 Alessandro introduced Il Sole di Alessandro, from a two-hectare vineyard planted with Cabernet Sauvignon on sandy terrains (an anomaly in the Valley of Dudda). A Picchio is a woodpecker, and refers to the birds in the woods around the vineyard. The wine, a blend of Sangiovese and Canaiolo based on Baron Ricasoli's formula for wines to be aged (no white grapes), is deep brick ruby with cherry rim. The bouquet is rich, with jammy berry fruit supported by warm cherries, some underbrush and savory accents. Very young, but nicely developed and displays considerable depth -- a wine to converse with. On the palate it's medium bodied and rich, with powerful berry fruit supported by smooth sweet tannins that have slight balsamic accents and flow into a clean fairly bitter finish. Quite nice in a fairly traditional key, and will drink very well with red meats. A porterhouse cut would be perfect. This is Sangiovese Grosso; it's a slightly deeper cherry ruby than the Picchio, and has an elegant bouquet with delicate red berry fruit supported by warmth and spice with clean cedar; the wood-fruit balance is quite nice, and it displays great depth. On the palate it's full, with deft red berry fruit supported by the clean bright slightly brambly citric acidity typical of Sangiovese and by tannins that are very smooth, and tightly woven, flowing into a clean fruit laced finish. Very nice, and though it's quite drinkable now and will bring considerable joy to a meal built around a roast, it will age well for a decade or more, and richly reward those with the patience to give it time. This is Sangiovese and Cabernet Sauvignon, a blend that was one of the most popular during the period that Supertuscans were attracting most of the attention bestowed to Tuscan winemaking. Considering the limitations imposed upon Chianti Classico at the time (among which 30% white grapes, including Trebbiano), that wine writers should find the Supertuscans more interesting is not a surprise. This one continues to be interesting, though it does have a slightly dated feel to it -- like opening a window onto the past, a past that one revisits with joy, but nonetheless another era. It's inky black cherry ruby with brick rim, and has a rich bouquet with red berry fruit supported by warmth and cedar, with hints of balsam, wet clay, and underbrush, and deft graphite shavings too. Quite a bit going on, and it brings to mind a lazy late summer afternoon to mind somehow. On the palate it's full, and rich, and still coming together, with clean savory berry fruit supported by tannins that have warm splintery accents and flow into a clean slightly bitter finish with lasting warmth. Quite nice, and will drink very well with steaks and other hearty grilled meats, but I found it a touch drier than I might have liked. In other words, a wine to accompany succulent foods, but not to sip far from the table. This is Dr. François's most recent addition to the fold, and in keeping with current enological practices, it's a single varietal wine, made from Cabernet Sauvignon. Inky pigeon blood ruby with violet rim. The bouquet is elegant, with powerful forest berry fruit, in particular black currant fruit, supported by warmth, some leather, and hints of horse hair, while there are also underlying jammy accents. Quite nice, and a pleasure to sniff repeatedly. On the palate it's full, rich, and very smooth, with powerful red berry fruit supported by warmth, moderate acidity that provides direction, and smooth sweet tannins that flow into a clean bright finish. It's quite elegant, in a slightly softer and more seductive key than the others. This is primarily Cabernet Sauvignon, with 10% Merlot. It's impenetrable pigeon blood ruby with hints of almandine on the rim. The bouquet is deft, with clean slightly balsamic fruit -- forest berry fruit and black currant fruit -- with some underlying cedar and pencil shavings. Nice balance. On the palate it's full, and rich, and very smooth, with powerful berry fruit supported by moderate warmth and clean sweet tannins that have a cedary underpinning and flow into a clean warm finish. Pleasant, though a touch more marked by oak than I would have liked, at least in a tasting situation. The tannic underpinning will instead contribute nicely to succulent roasts or hearty stews, and it will age nicely for a decade and perhaps longer. Bottom line? Beautiful wines, which are bound by a common tread, but are also very distinct from each other. I much enjoyed them. Want to know more? 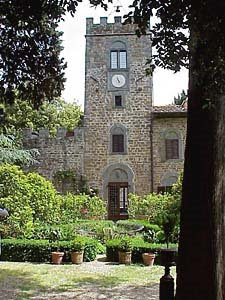 Castello di Querceto's Site. Pale brassy white with fine perlage that's quite intense. The bouquet is clean and bright, with lively green apple and pleasant savory accents. On the palate it's full and bright, with lively crisp apple fruit that flows into a tart green apple finish. Quite approachable, and will drink well as an aperitif or with foods -- Indeed, an Italian might say it's a tutto pasto, suited for the entire meal. Pale brassy white with fine perlage. This is a bit sweeter than the brut, and is their most common Prosecco. Its bouquet is fairly rich, with green apple mingled with some delicious apple, and some sugars, with hints of minerality. On the palate it's full, relatively sweet, ample, and quite soft, flowing into a tart apple finish. It's more direct and more approachable at a general level than the Prosecco Brut, though wine lovers will likely prefer the Brut. I did, at least. It's a question of stylistic preference. Pale brassy white with fine perlage. The bouquet is deft, with green apples mingled with delicious apples, some minerality, and apple skin sweetness. On the palate it's full and rich, with clean fairly sweet green apple fruit supported by sparkle and moderate acidity that that works with the sweetness. The overall impression it gives is quite welcoming, and it will work very well as an aperitif, especially for those who are unused to brut wines. In short, a nice, approachable and versatile wine that will appeal to a wide variety of drinkers, though not, perhaps, to the strictly Champagne/Franciacorta set. This is from the Abruzzo, and is made from an autochthonous varietal known as pecorino because sheep like it. It's pale brassy gold with intense fine perlage, and has a fresh mineral bouquet with some gunflint that gains in intensity with swishing. On the palate it's fairly full, with bright mineral-laced tart fruit supported by dry minerality and sparkle, while there is also an undercurrent of sweetness -- it's not bone-dry -- and flows into a clean bitter finish. Pleasant, and will work nicely as an aperitif or with foods; more of the cheese and egg sort than fish, I'd say, because though there is quite enough acidity to stand up to fattier foods there's an undercurrent of softness as well. Pale brassy yellow with fine intense perlage. Elegant bouquet with pleasing floral accents mingled with citrus and honeysuckle with underlying minerality. Elegant, and quite inviting. On the palate full and rich with clean honeydew melon fruit that gains direction from deft citric acidity and slight bitterness that flows into a fairly long savory finish. Quite nice, with excellent depth and richness, an wine that will work very well as an aperitif or with foods. Drawbacks? The bottle will likely go too fast. Pale brassy white with fine perlage. The bouquet is fairly rich, with gunflint minerality laced with some citric notes and savory accents On the palate it's rich and bracing, with lively citric fruit supported by clean citric acidity and nice sparkle that flow into a clean tart finish with peppery accents from sparkle. It's quick to write, but quite harmonious, in a sassier key than the Kerner: If the former is a beautiful woman in an evening gown, here she's dressed to go hiking eager to set out. This is a blend of 85% Pinot Noir and 15% Raboso. It's pale pink with fine intense perlage, and has a clean bouquet with fairly bright acidity supported by red berry fruit and spice, with underlying bitterness. On the palate it's bright, with clean minerality and some cherry and forest berry fruit that is more hint than fact, with pleasing fullness from sparkle and minerality that flows into a clean mineral finish. Very much a Rosé brut, and will drink nicely as an aperitif or with delicate meat dishes. Fish, too. In short, versatile. Bottom Line: Carpenè Malvolti is doing some very interesting things. Want to know more? Their Site.